In this review you will find proofs that Step To Wealth is a scam that is trying to take your money. It is presented by Richard Williams. Williams claims that he created a binary options trading system that can make you $10,000 per day, so it allegedly can make you a millionaire in 90 days. This system is called Step2Wealth. And who would bother to become a millionaire, if it was not free, right? So StepToWealth is of course free. The truth of course is that Williams is a liar and Step2Wealth is a scam. The only thing you can expect from this program is to lose money. Let’s start with testimonials. Williams is trying to persuade you with endorsements from people who are allegedly making money with his system. But all these testimonials and reviews are fake. Here is a proof. Look at the picture and you will see that this woman is a Fiverr actress who sells testimonials for five dollars. Anybody can hire her to endorse anything they want. We tested the Step2Wealth trading software and we immediately recognized an app developed and used by scammers only. This software is used by a lot of binary options scams, like Cognitrade, Hexa Trader and Neuro Trader. Look at the picture to see the proof. 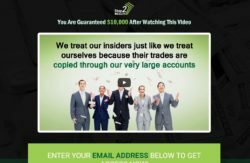 We are getting a lot of feedback about this software that Step2Wealth is using and we know that it is losing money in real trading! So how does Step2Wealth really work? It’s easy. The program is not free, because in order to be able to use it, you will have to deposit at least $250 with a broker that will be selected for you, you will have no choice. The reason for this is that people who are behind StepToWealth are associated with this broker, they are getting paid for referring new depositors to this company. This is the only purpose of this program. If they manage to make you deposit money, you can expect their robot to lose your money. Step2Wealth is a total scam that is designed to make you lose money with a worthless trading software. Stay away from it! If you want to succeed in trading and make money with binary options, you first have to learn to trade profitably. You can do that on a free demo account. Only then you can switch to a real account and invest your own money. BEWARE of FX Revenge, it’s a scam!